Interior Secretary Ryan Zinke will leave his administration post at the end of the year, President Donald Trump announced early Saturday. Zinke submitted his resignation to the White House Saturday, an administration source told ABC News. The president, who made the sudden staffing announcement on Twitter, thanked Zinke for his service over the last two years. 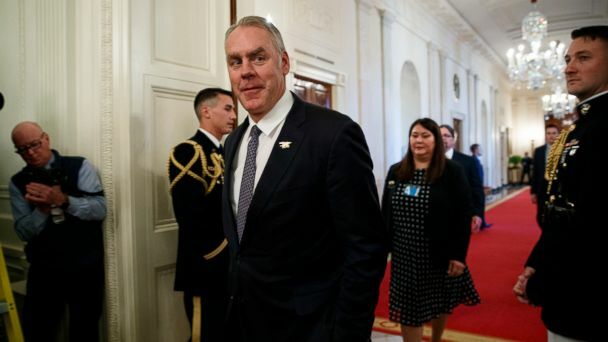 "@RyanZinke will be leaving the Administration at the end of the year after having served for a period of almost two years," the president tweeted. "Ryan has accomplished much during his tenure and I want to thank him for his service to our Nation." Zinke's replacement will be named next week, the president said. The White House did not immediately respond to an ABC News request for comment about what prompted the sudden announcement of Zinke's departure. The announcement came just a day after the president announced that his budget director, Mick Mulvaney, will step into the role of chief of staff on an acting basis in the new year when Chief of Staff John Kelly will depart. Zinke has faced multiple inquiries by his department's inspector general and congressional investigators since he took office, including into his travel and whether he was improperly involved in a real estate development in his hometown. At least one of the investigations into Zinke's conduct was referred to Department of Justice, though it was unclear whether the department intended to act on the referral. Zinke has maintained that he will be cleared in the investigations and has followed all department ethical rules. In a statement Saturday, Zinke referenced inquiries into his conduct as one reason for his departure. "I love working for the President and am incredibly proud of all the good work we've accomplished together," he said. "However, after 30 years of public service, I cannot justify spending thousands of dollars defending myself and my family against false allegations." Sources tell ABC News Zinke had been asked to leave the administration by the end of the year, as it had been expected that he would come under greater scrutiny under the incoming Democratic-controlled Congress. In November, Zinke publicly attacked top House Democrat Rep. Raul Grijalva after he called for Zinke's resignation and promised intense oversight of Interior in the new Congress in January. In a tweet, Zinke accused Grijalva of "drunken and hostile behavior," in an apparent reference to the lawmaker's battle with alcohol addiction in the 1980s. Grijalva sought treatment for the addiction. In a statement, Grijalva said he hopes Zinke's replacement will be more amenable to working with the committee. "This is no kind of victory, but I'm hopeful that it is a genuine turning of the page," he said in the statement. "Secretary Zinke's successor has a chance to move on from on an unfortunate Trump administration record of environmental mismanagement and decline. A well-managed Interior Department - one that puts the public good ahead of fossil fuel and mining industry demands - can be a boon to the entire country." "The next Interior secretary should respect the American people's desire for strong environmental standards and an end to corporate favoritism," the statement continued. "The Democratic majority on the Natural Resources Committee will be ready to assist in that effort starting in January." Capitol Hill sources told ABC News that Zinke's personal attack on Grijalva would have made it difficult for the committee to work with him and that they expected he would ultimately resign. In his role as secretary of the interior, Zinke successfully pushed to expand energy development on public lands, including a major offshore wind energy sale in Massachusetts last week. Zinke also sought to secure more funding for maintenance in national parks, an initiative for which he enjoyed bipartisan support. The Senate's top Democratic, Chuck Schumer, celebrated Zinke's announced departure in a tweet, accusing Zinke of doing damage to the country's natural resources at Interior. "The swamp cabinet will be a little less foul without him," he wrote. House Committee on Natural Resources Chairman Rob Bishop praised the outgoing Interior Secretary in a statement. "In the world of Washington politics, Zinke was an anomaly," Bishop said. "He had a vision of a better future - an efficient department; a park system without a backlog; a staff who listened. Where others dithered he got stuff done. We owe him a debt of gratitude."